These german silver turquoise Zuni inspired inlaid stone earrings contain a mosaic of semi-precious turquoise stones in different shades of turquoise. These natural stone earrings are mounted on hypoallergenic french ear wires. 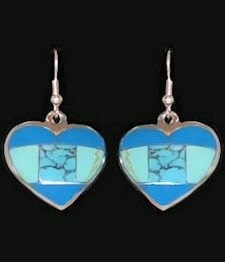 Each heart earring measures approximately 7/8" wide by 1" tall, not counting the ear wires. This product was added to our catalog on 09/12/2018.